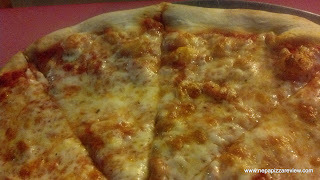 I found myself to be a little light in the Dunmore area for pizza reviews, so I took to the twitter world for suggestions. 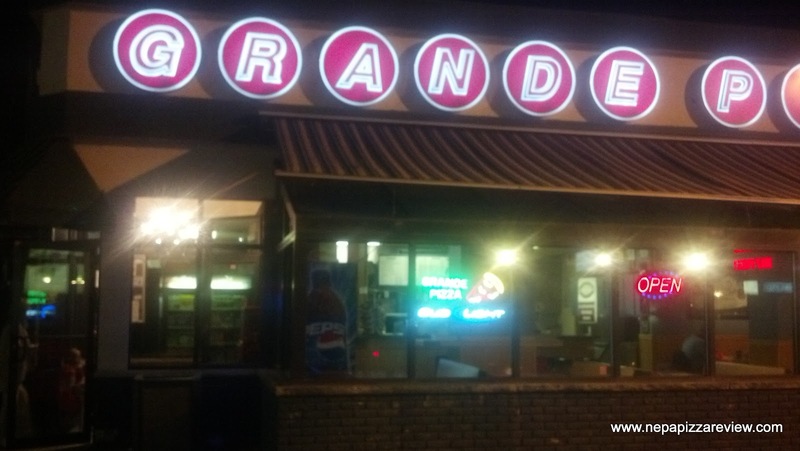 I got suggestions for Nina's and Nardozzi's, but Nina's was packed with no tables, and Nardozzi's didn't appear to be a place we wanted to sit down and have dinner at so the next place we found was Grande Pizza. It was a casual place to sit and eat with a few booths and quick service. It's certainly not a fancy restaurant, but seemingly a nice place to grab a pizza and wings. 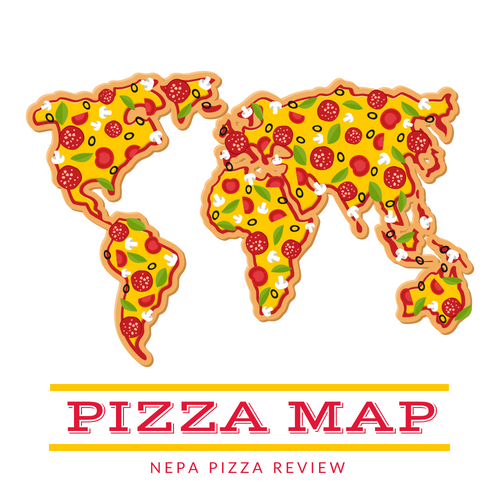 My co-reviewer and I looked over the pizza selection and noticed that they had a variety of pizza: New York Style, Sicilian, Old Forge, and Round Old Forge style. 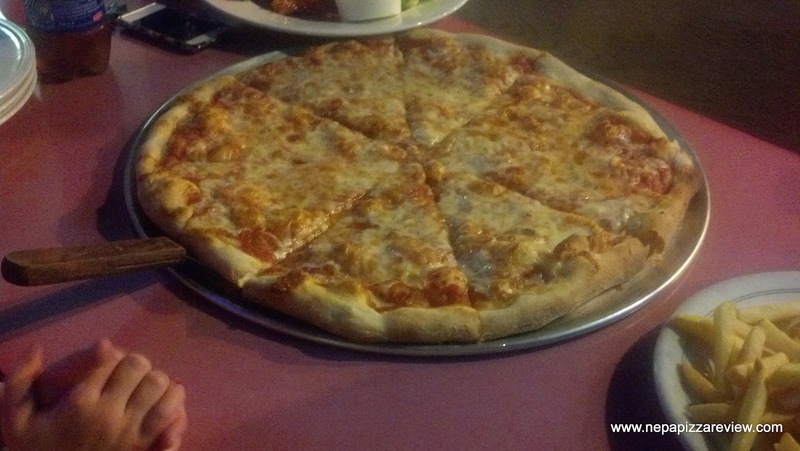 Although the round old forge really peaked my curiosity, I seemed to remember someone telling me that the NY style was their best pie, so we went with a large NY pizza. It was ready in a hurry, and when the waitress delivered the pie to us, I knew I was going to like it. It's a classic NY style, with a little thicker crust. The whole pie was prepared and cooked as well as it could have been, so I was excited to try it. The crust was probably the best part, as it was crispy on the bottom, soft in the middle, but not doughy like some thicker round pies. It was very flavorful and had a very nice fluffiness to it. There wasn't a ton of sauce, but certainly enough to balance the pizza out and provide some moisture. The sauce was neutral, and very tasty. The cheese was a pretty high quality mozzarella that was pretty tasty, slightly salty, and had a slight buttery finish to it which I particularly enjoyed. There wasn't anything in particular that jumped out to differentiate this pizzas from the pack, but it's good ingredients, fine preparation, and cooking perfection put this into the above average category. A classic new york style pizza with a slightly thicker crust. Very good, and I'd be very interested to try the old forge round!